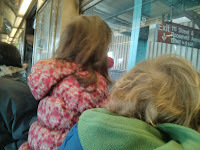 We had a bona fide urban adventure today. 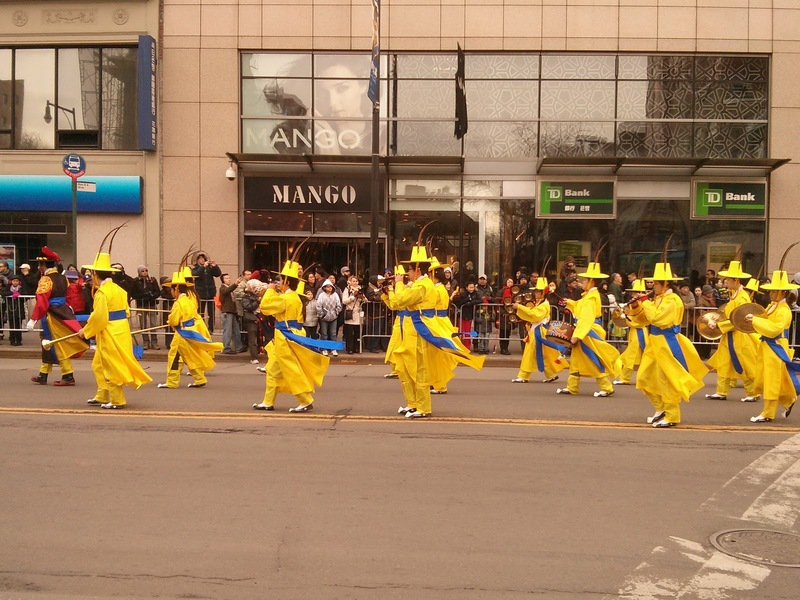 We went to Flushing, Queens to see the Lunar New Year Parade. It was pretty awesome. We met our friends at the subway, then took the trusty 7 train to the parade route. When we came out, we found the streets were still empty, so we got some snacks at the Taipan Bakery. If you've never had Chinese pastry, I highly recommend it. Then we secured a spot along Main Street, and waited for the parade. 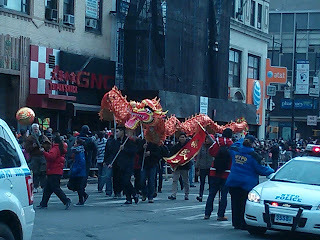 Of course, the biggest attraction is the dragon dancers, and we were not disappointed. This guy was one of three in the main section of dancers. Later on there were some smaller lions which were equally impressive. We also saw a police department marching band, several Tai Kwon Do schools and various civic organizations. The kids had a blast. In addition to Claire and Ben, our friend N was with us, along with her parents. The girls get along swimmingly, and Ben absolutely glows when he's around N's dad, P.
I loved the costumes - bright colors cutting thorough the grey winter day. 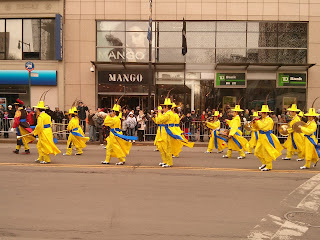 These guys (below) were my favorite - that yellow with the blue sash. They were a traditional band, playing horns of every shape and size, including several dudes blowing conch horns. Afterwards, we took our friends to our favorite noodle shop, Nan Xiang-Dumpling House, and had a wonderful lunch. That sounds like so much fun! And I love Chinese pastry so! And Bubble tea! When I was in during the spring and summer I found a place right by the hotel that sold it! Yum!